The new “DOMAIN” reel from Sage combines the classic full frame with modern large-arbor design, and the high performance of advanced technology with the dependability of tradition. Available August 2014. Bainbridge Island, Wash. (June 12, 2014)–With a nod towards traditional designs, Sage has reimagined the full frame reel preferred by many two-handed purists with the new DOMAIN series. Combining a full frame design to ensure no line pinches and the modern-day advantages of larger arbor and Sage’s Sealed Carbon System (SCS), the DOMAIN offers high performance not previously found in full frame reels. Created from fully machined 6061-T6 aerospace grade aluminum, the DOMAIN is cold-forged and tempered for superior strength and rigidity. Each model is hard anodized for surface protection and corrosion resistance, and the concave, ported large arbor offers great strength and impressive capacity. The one-revolution drag knob has numbered settings for consistency. The DOMAIN easily converts from left to right-hand retrieve and is available in platinum, stealth and lime. 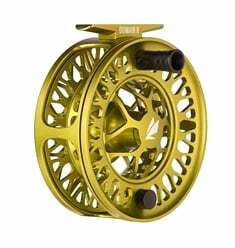 This reel family is offered in size 5, 8, and 10 and will be available in August 2015 starting at $340.